How peppy I feel in the morning is directly tied with how well I was able to sleep the night before. Last night left me feeling relatively unpeppy this morning so we had a bit of a quiet day, which was fine because Benjamin and Miriam weren't feeling too alert either. We're all trying to finish off this cold we have. We did a lot of reading and a little bit of playing while we waited for Rachel to come home from school. We checked out several Eric Carle books from the library. Miriam requested that we read "The Hungry Little Patter-killer" because that one's her favourite, but we also read The Very Busy Spider, which involves several slovenly farm animals tempting a spider to abandon her work. Benjamin thinks animal noises are hilarious right now and loves when we read stories with a lot of animals for that very reason. He seemed to attempt to mimic a few of the animal sounds, specifically the dog and duck. Later, when we were having lunch, Miriam tried to quiz him on his animal sounds. "What does a dog say?" she asked him. He stared at her without making a peep. "No!" she said. "That's what a giraffe says, silly boy!" She's a silly (though clever) girl, herself. She was nattering on and on all day today. "Did you know that giants can eat people? Yeah, they can. Because you know that in Mickey and the Beanstalk there were giants in that world. But I think they're only in Mickey's World. They're not in this world, so we'll be okay. This world is...Heiss World. And there's lots of things in Heiss World. Like, Mary Pope Osborne is in Heiss World, I think. She lives in New York and that's close to Florida so, know what? I'm going to write her a letter. I'm going to write Mary Pope Osborne a letter right now!" And she did. And she drew a beautiful picture of a tree with a treehouse and a cardinal. "Does Mary Pope Osborne know what cardinals are? Does she know that they're red? Does she know what red is? What about blue? Does she know brown? Orange? Purple?" I assured Miriam that Mary Pope Osborne was a very well-educated woman who knew much about many things, including all the colours of the rainbow. Today was an early-out day which meant Rachel got home a couple hours earlier than she normally does. Benjamin went down for a nap right before we were due to meet her bus and she and Miriam disappeared into their bedroom moments after walking through the door. They had big plans to make the best bit of fan mail Mary Pope Osborne had ever received. 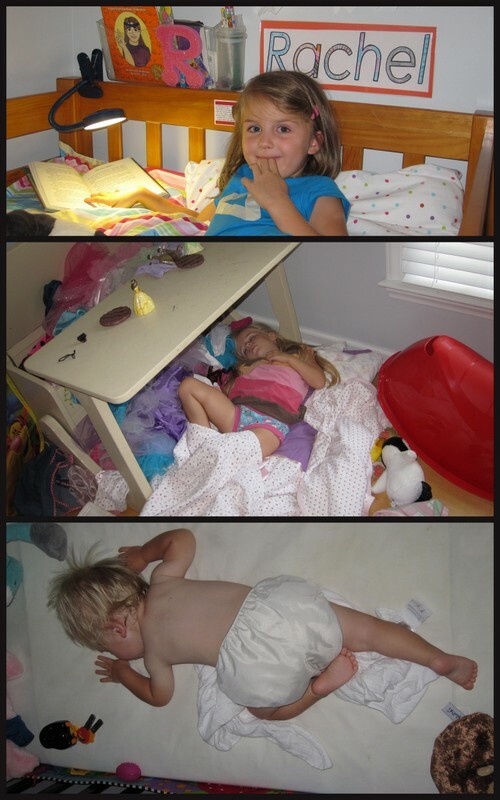 "Benjamin's sleeping and the girls are playing together so nicely. I think I'm going to take a nap. You can just keep working," I informed Andrew. I had a wicked headache and just wanted to sleep. Sometimes Andrew will clear out of the bedroom for me so that he doesn't disturb me but I was so tired that that wasn't really a risk today. When I woke up my head felt better but the house was just as quiet as it had been when I had lain down an hour previously. I got up to check on my unusually silent house. Andrew was busily working away on his computer, which is where he usually is during the day since he's been working at home this summer. Rachel was reading on her bed. Miriam had been having all sorts of fun but had fallen asleep in a fort she'd built under the desk (her walls had fallen down by the time I found her), and Benjamin as still snoozing in his crib. "I'm sorry this was such a lame early-out day," I said to Rachel. "Why do you say it was lame?" she honestly wanted to know. Obviously the answer was because the two younger kids and I slept through the entire afternoon that we could've spent doing something fun and exciting—like visiting the museum or planetarium or swimming or whatever. "When I read The Magic Treehouse I feel like I go all over the world!" Rachel told me. I suppose she got her afternoon adventure in after all. After she'd finished the book she was working on (A Perfect Time for Pandas) we got the little ones up so we could get busy. We had to do all the chores we'd left undone, such as unloading the dishwasher. I just love this picture of Benjamin. What he's really doing is yelling at the top of his lungs while drumming on the pot with a butter knife (which was a fun spectator sport for Miriam until he decided to test the timbre of her noggin). It looks, though, like he's just conquered the fierce dishwasher-beast and is saving all the dishes from its steamy belly. After stomping around the house for a few minutes (when I told her that she couldn't "just read another book before helping"), Rachel helped make dinner. By this time, Daddy had left us to help drive the youth to the temple for their monthly temple trip so we were all on our own for dinner. I let Rachel decide what to make—hot dogs, fruit, and carrot sticks. It was a feast. We also ate outside, which was terribly exciting for a variety of reasons: a) it was outside, b) Benjamin sat in a big-boy chair, c) no crumbs on my kitchen floor. After dinner we went on a walk to the park. Rachel insisted on bringing her panda (who was today named Polly, since that's what Annie named the panda in A Perfect Time for Pandas) so Miriam insisted on bringing her penguin (who today was dubbed Penny). I let them play at the park for about twenty minutes because I was worried that our nap time might have ruined our bed time and figured that running around in the heat and humidity would offer some redemption. We all had a great time. Benjamin loves the swing now (though the slide still makes him nervous). The girls were helping their stuffed animals do all sorts of things on the playground until they got bored with that and then the penguin ended up sitting in the stroller while the panda shared the baby swing with Benjamin. The tape on Rachel's shirt is because it's "shape week" for the kindergarten classes so now we've been asked to wear clothes with certain shapes on them to school. Kimball, her friend Eliza's brother, told how he went to school with duct tape shapes on his shirt last year and Rachel has been waiting to do that ever since. On Monday she was disappointed when I told her she could wear her shirt with peace signs on it. On Tuesday she was disappointed when I found her s'mores shirt (the graham crackers are squares). Today, though, we couldn't find any clothes with triangles on them so I let her make a triangle out of tape. She thought she was the bee's knees. And she's already "made" a new shirt for tomorrow—trapezoid day! He was using the panda as a pillow for awhile but lifted his head up just as I was taking the picture. It was cute, but you'll have to use your imagination. He's my little drop of sunshine. He kept me company this evening after his sisters (finally) went to bed. They were so wound up; I'm not sure if our park-walk helped or hurt. All three of them were crawling wildly around the house (while I kept trying to catch Benjamin and pin him down long enough to get his diaper on). Anyway, after his sisters were in bed we played Pat-A-Cake until he was ready to go to sleep. We played the whole game a couple of times through while I helped him with the actions, but he has little patience for the middle part of the song (patting, rolling, marking with a b—what for?) so instead I'd just let him clap as long as he wanted while I sang through as much of the song as he'd allow before wrapping his arms around me for a big snuggle while I skipped to "throw it in the oven for the baby and me!" He eventually (but not for like twenty minutes—seriously) got tired of that game and wanted to nurse; he fell asleep soon after that, leaving me to recharge for another (hopefully more-productive, less-sleepy day) day.